A protest march organized by the Nabaviyyah Islamic Youth Organization in Colombo, Sri Lanka, on 24 September 2012. Photo: Vikalpa | Ground Views | CPA/flickr. September marks the first anniversary of Muslim outrage over the anti-Islam film Innocence of Muslims. The furor over the crude video clip depicting Muhammad as a womanizing buffoon was the latest installment in a series of disputes over Western depictions of the Prophet. 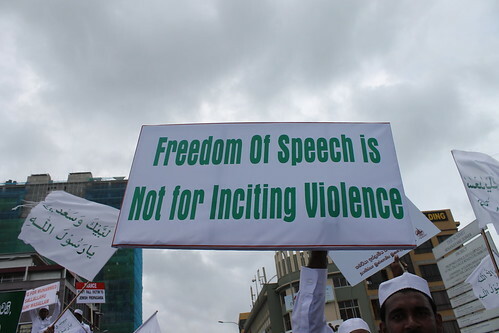 As some liberal secularists think that Muslims who are reluctant to accept the principle of free speech are best dealt with by habituation – constantly exposing them to (possibly offensive) free speech -, further explosive incidences of giving and taking offence can be expected. The problem of giving and taking offence is probably best illuminated by the ongoing struggle over blasphemy and hate speech in the legal arena. For over a decade, members of the Organisation of Islamic Cooperation have attempted to introduce binding legislation against the defamation of religions at the United Nations, only to be blocked by Western states. Muslims in Western countries have frequently lodged complaints against offenders under hate-speech or blasphemy laws, but have rarely scored a legal victory. The reason for their respective failures boils down to one major factor – competing values of free speech and respect for religion. For many advocates of free speech, the right to criticize religion and authority is an important tenet of Western civilization, ensuring freedom, progress and democracy. Free speech is not an absolute value, but is only restricted to safeguard the well-being of individuals (i.e. from slander, hate speech or violence). For many Muslims, however, free speech must also be constrained when it comes to religious convictions. They perceive certain speech primarily as an insult to their religion rather than legitimate criticism, especially when it concerns the integrity of the Qur’an or the character of Muhammad. As Mehdi Hassan explains in this heated debate, the Prophet deserves more, not less protection than any other individual, as he is for them closer to their heart than even their next of kin. However, the issue has more dimensions than the simple disagreement about who or what is worthy of protection from offensive speech. It is usually not the most egregious violations of Muslim sensibilities that provoke global outrage, but those incidents perceived as emblematic of wider Western attitudes towards Muslims. For instance, Muslims experience offence in the context of discrimination in Western countries, Western support for authoritarian Arab regimes, the wars in Afghanistan and Iraq, U.S. drone strikes on innocent civilians and Western acquiescence to Israel’s blatant disregard for the human rights of Palestinians (a more in-depth description of these Muslim viewpoints is provided in Abbas Aroua’s new book). 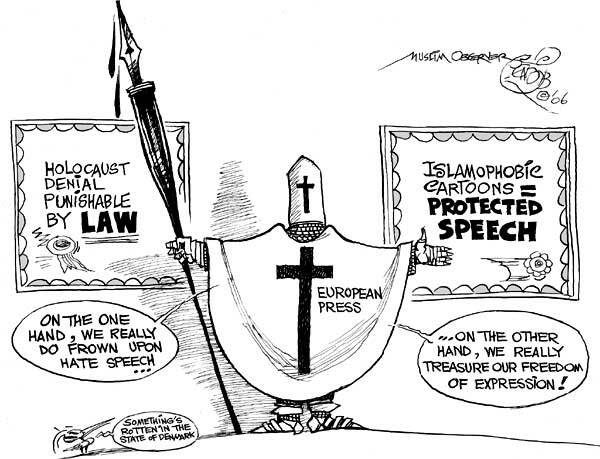 Moreover, they also see the West’s commitment to free speech as hypocritical: Holocaust denial is a punishable offence, whereas insulting the Prophet is not. For advocates of free speech, the perspective is different. Only some think that Islam (like any other religion), as the late Christopher Hitchens put it, “poisons everything”, and is a source of conflict that must be fought relentlessly. However, many in the West are concerned about the misuse of blasphemy laws in Muslim countries, the suppression of human rights in the name of Islam, and the rhetoric and deeds of violent extremist groups. For some, the Muslim reaction is not a sign of genuine distress but an attempt by a vociferous group to impose their views on the rest of society. A look behind the stark opposition of free speech and religious sensitivity thus often yields a surprising commonality: a concern about justice, equality, and resisting abuses of power. This is, of course, not true for all parties to the debate. Some Westerners are motivated by outright xenophobia, whereas some Muslims are motivated by dreams of Islamic supremacy alone. Yet, there seems to be scope for understanding and seeking consensus among a large spectrum of actors whose views fall somewhere between the extremes. Again, a look at past incidents may help us to understand how future ones might be prevented. Violent expressions of outrage and disgust do not spread throughout the Muslim world like wildfire. Instead, they start as small flames that need considerable nourishing before they evolve into blazing infernos of rage. Before rioters try to scale the walls of Western embassies in the Middle East, there are usually weeks of angry media performances, western dismissals of Muslim demands, continued publication of the offending material and the lobbying of religious and government authorities by Muslim communities in Europe. And while the more influential media performances often feature public incitement to violence, to begin with many protests are well within the bounds of desirable democratic expression. The escalation from democratic expression to calls for violence is in part due to some Muslim leaders seizing the initiative with extreme statements that set the terms of the discussion. This, in turn, forces others to take a harder line than they otherwise would have so as not to appear weak. Some of the main agitators associated with the 2005 Danish cartoons controversy, such as Raed Hlayhel or Ahmed Akkari, were undoubtedly motivated by fundamentalist fervor. Others, like influential cleric Abu Laban, were only drawn into the affair as rhetoric escalated and their standing in the community was threatened by their silence. However, escalation can also be facilitated by the Western response to Muslim indignation. At the start of the Danish cartoons affair, the then Prime Minister Anders Fogh Rasmussen affronted Muslim ambassadors by refusing to meet over the incident. When angry Muslims sent letters to Viking Penguin, publisher of Salman Rushdie’s The Satanic Verses, they were told that they had misunderstood the book and that there was nothing to be offended by. This dismissive stance hardened the fronts. Being offended turned into every Muslims’ duty, and few Muslims dared to voice more nuanced sentiments publicly. Tellingly, in cases where offence was clearly intended to provoke, such as the Innocence of Muslims movie, most Western governments and free speech supporters have readily condemned the offence as well as violent reactions. Although in this particular instance global outrage could not be prevented anymore, the lack of sustained local controversy meant that international protests and violence died down quickly, whereas the Danish cartoons and the Rushdie affairs lasted for years. So how might both sides work to prevent violent incidents over their differences regarding free speech and respect for religion? The following recommendations do not rely on the restriction of free speech, and could be implemented without resolving the legal debate over where free speech should end. More, not less speech. Establish a culture of discourse that is capable of preventing, absorbing and dealing with new offences non-violently. This might entail the setting up of discussion forums, working groups, joint publications and public events. Clearly address underlying concerns. Address issues of deeper concern to actors on both sides of the debate, such as human rights in Islam or discrimination against Muslims. This may prevent many free speech advocates from feeling that they have to rely on offensive speech in order to bring issues to the agenda and unaddressed Muslim grievances from crystallizing around offensive speech. If contentious events still occur, steer the discussion away from the offence itself, but move towards addressing underlying issues. Keep it local, keep it broad: Prevent the polarization and internationalization of debates by giving a forum to and taking serious the concerns of respected community leaders who may take strong positions but are nevertheless open to dialogue. This enables them to establish themselves as opinion leaders, prevents radicalized elements from dominating the discourse via more effective media imagery and reduces the chances that the discussion becomes internationalized. Promote internal dialogue. Internal dialogue to strengthen support for moderate views may be even more important than dialogue between both sides. These suggestions do not guarantee that future incidents will be prevented, and will not have much bearing on individual fanatics ready to use violence. Yet they may help to steer the debate towards shared values and facilitate dialogue instead of violence. That way we might not be forced to mark as many new depressing anniversaries on our calendars in the future. Niklas Nau is an intern at the Center for Security Studies’ (CSS) Mediation Support Team. Mediation Perspectives” is a sub-series of the ISN Blog offering a mediation perspective on questions of conflict and peace. It analyzes specific aspects of today’s conflicts in ways that highlight possibilities for mutually acceptable agreements.